I will keep on updating this page as and when the new experience happen. I am writing this after so many days since due to the work priorities hopefully I will come up with some new pieces accumulated on this page for Bhramanti. This was my first experience of visiting Chicago and second time visit to US. I was shocked as soon arrived here in Chicago on 4th Feb. Sunday evening due to the Cold. It was -30 C. 1st time ever experienced such cold in spite of having extreme condition in high altitude experience. It was horrible but I generally like the extremities so practically I enjoyed the cold here in chicago. Actually I was supposed to land up on Saturday but due to ticket unavailability I came her eon sunday 4th Feb.. On top of that since couldn't able to get the Jacket for cold I went joined the client office without any jacket on me. My boss too got shocked and blasted on me to get the one ASAP. For me it's same environment like Frankfurt/Liverpool/Philadelphia but my work restricted me to see only one route that is to and from my house to office road till now (almost 2 and half month since from my arrival). After continuous 3 weekend work, this time in the midst of dual mind to go or not, we 4 animals(Sumit, Mayur, Siddharth & myself) of the Presidential Tower zoo, decided to visit the lincoln park. The sunny day and 3 new cameras eagerly waited for long in the apartment since from the day of purchase. Some more camera were supposed to arrive but last moment rush we had enough one. The Zoo is not far from the City center, 10 bucks for a Taxi, happily we four animals went inside the Taxi forgetting all pending office work/ phone calls etc. It was a another unique experience for us this time. First is climbing artificial wall in US and important one is climbing on rotating climbing wall. One of the Bhramanti member KK (Murugesan) and me planned to visit the place called lincoln Park Athletic Club which has this facility along with fixed big wall. The fixed wall is of height around 50ft. They have an ICE wall too for practicing as per the organiser. Since we were interested in just bouldering practice we registered for a day costing us 20$ each. It doesn't required climbing shoes as such if you are just 1 timer a month. The rotating wall has several program and each program has its own speed and difficulty level. from vertical climb to overhang. You can set the speed as per your capability. It gives you controlled way of simulating the speed climbing with various gradation depending upon what is been selected. We tried all programs and since it was first time after 3 months of gap for me it was fun and complete refreshment. we both were charged up and after the quitting the club started planning the best way to catch up the momentum keeping the money matter in mind. It was fun all together. We enjoyed the climb very much. While leaving spent some time to observe the wall built outside where some new route setting was in progress. To get into the these route one has to get certified with their climbing certification program first. So let see next time. Visited this zoo along with one of the Bhramanti member Mahendra S. & his family and office colleague Mayur K. It was worth spending 16$ inclusive of the basic fee 10$ & additional 6$ for the 3 other events in the zoo like Dolphin show, Motor ride & Butterflies. We got few best click of the year during this visit. It may be part of photo contest of Bhramanti's annual event. After a long period of time, got a breathable time to attend the ad hoc plan to visit the Lake Michigan. I should be thankful to my office colleague Alejo. We left office on 5th Oct evening, stuffed all essential from my home. Meantime his friend Dena picked him on the way & reached my residence to pick me up for further drive towards the North Point Marina. We had a dinner on the way and then visited a music group specially the drummers. The controller Johnny gave us the Jambe to practice. We didn't realize the time we spent while playing the Jambe. It was fun to play such drum specially for me being untrained practitioner of Indian drums(Dholki) & liking in playing such instruments. I played some Indian folk tunes. 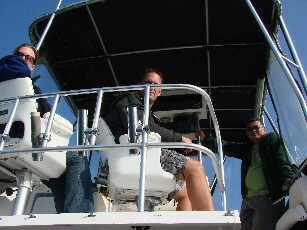 Later we drove to the North Point marina where Alejo's boat docked. This was my first ever experience staying on such well equipped houseboat. Next day morning we all went on fishing with his neighbors boat with Dena's family. we drove the boat deep inside the Michigan lake may be 10miles and the boat owner fixed his multiple fishing instruments. We got 1 big fish, it was happy day for these people even they got just one big fish. Since I wanted to collect my marathon kit before 6pm we return back to by 1pm to the Marina & then drove back to the place where I was suppose to collect the kit.All together it was one of the relaxing day after long time for me. 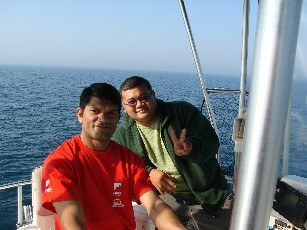 Thanks to Alejo for the boat ride. 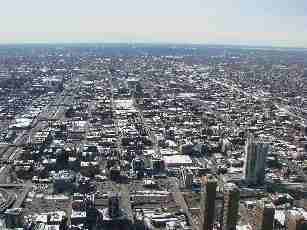 After more than one year, the most awaited visit to Sears Tower came in reality on the sunny day of 22nd Mar 08. I was bit worried since, not sure till the time we reach on top of Sears Tower. They call it as "The Sky deck". I was worried due to the weather, might play some twicks to chop down the aim of my visit. Fortunately everything went right. We were happy to see so many people in queue to get the glimpse of the view from the clear sky on that day. My new roommate Santosh accompanied me since it was his 1st time ever to see any special thing of Chicago since from his arrival in US. It was worth spending $13, which gives the visual insights of the History channel clip(Video) to knew about the history of the tallest building in the world(5th) and off course the Tower. We could able to see the 360 degree view on Chicago. Last year during same time visited this place. And now almost after one year got chance/time to practice on the wall. Its one of the biggest wall ever I saw till date. One hasto go through the compulsary orientation class through the wal coordinator/instructors, and then ready to go. I climbed 3 routes, where each max height gained is 60ft out of 110ft. Its almost after a year I touched the wall so it was expected. Hoping to complete all the routes as and when I visit the wall. It's nice filling when you do your likable activity. The weblink of the wall details. Visited this druming circle 2nd time and I am going to enjoy this. I like playing drums specially of Indian style. Courtesy to Alejo; my office colleague introduced me to this group last year. People meet here just to play the drums and practice. May be first time this group had heard one of the song in my language (Marathi) sang by me, to get different rhythm to play the drums. It happened again when I visited this time too! This time group was big around 20 drumers from small kids to aged people. It's relaxing experience. This is 1st ever experience for me to drive on highway and apart from this we had family members(Wife, Daughter, Mother-in_Law) along with office friend Atin who was kind of walking guide/navigator instructing all the time on the way. It was satisfactory driving experience for me though I did few mistakes. Total driving distance was 130 miles including Chicago to Bartlett then to Gurnee and back to Chicago. This is 1st ever experience for me to play this unique game call racquet ball. Thanks to Alejo who arranged the playing court which is at Public park, Toughy Avenue. The Playing court is huge hollow room with ceiling is almost same as its length (40 ht X 40 length X 20 width) where the serving line is after 15th feet from the front wall close to both sides of the wal in case game is played as double. You will find detials of the game on internet. Good part is its been played indoor, hence no worry of Chicago cold. In the photo Alejo, Phil, Atin and myself. Courtesy Northern Trust, I had opportunity to visit the Chicago Botanic Garden. I drove with my family to the destination through the scenic internal route from Montrose to 1000 Lake Cook Road, Glencoe. This was the only tourist place I left unseen until this day in Chicago. Located at 1000 Lake Cook Road, Glencoe, Illinois, United States, the Chicago Botanic Garden is a 385-acre (156 ha) living plant museum situated on nine islands featuring 26 display gardens and surrounded by four natural habitats: McDonald Woods, Dixon Prairie, Skokie River Corridor, and Lakes and Shores. The Garden is open every day of the year. Admission is free but parking is $25 per car; free for Garden members. The Chicago Botanic Garden is owned by the Forest Preserve District of Cook County and managed by the Chicago Horticultural Society. It opened to the public in 1972 and is home to the Joseph Regenstein, Jr. School of the Chicago Botanic Garden, offering a number of classes and certificate programs. The Chicago Botanic Garden is accredited by the American Alliance of Museums and is a member of the American Public Gardens Association (APGA).The mission of the Chicago Botanic Garden is to promote the enjoyment, understanding and conservation of plants and the natural world. Realy it requires number of visits to explore/enjoy the garden completly. We just focused on Butterfly Bloom and flowers area. In good wheather condition its heaven for naturalist and photographers to explore many options. This was 2nd hike of the year outside India organiszed for celebrating 10 years of Bhramanti. Father Jacques Marquette, French-born missionary of the Jesuit order, and Louis Jolliet, Canadian explorer and mapmaker, were the first Europeans to view the land on which the City of Chicago was to stand. This is in 1673. It was not until 1803 that the War Department ordered the construction of a fort at the mouth of the river. Chicago was under the jurisdiction of Indiana Territory and Illinois Territory from 1801 to 1818. In 1818, Illinois was admitted to statehood, and Chicago was placed successively under the counties of Crawford, Clark, Pike, Fulton, Putnam attached to Peoria, and in 1831, Cook County. The name "Chicago" derived from the Indians but it is not known which tribe named the town and many theories have been advanced to explain the origin of the name. One generally accepted is that the name comes from the Indian words for either wild onion or skunk, but some historians believe that the word Chicago denoted "strong" or "great." Chicago became home to the world's tallest building in 1973 when the Sears Tower was topped off. The Sears Tower remained the tallest building in the world until February 13, 1996. The Sears Tower continues to be the tallest building in North America.